Wii Shortages and Myths (Pertinant to Econ 102) | Tom Schenk Jr.
Nintendo claims the shortage is not manufactured as one might wonder. While Nintendo claims a manufactured shortage is not good business, it does seem suspicious that the company did not ramp up production to meet demand for the Wii’s second Christmas appearance. Certainly the laws of supply and demand are working in Nintendo’s favor with customers clamoring to get their hands on a coveted Wii and dishing out the money to pay the inflated pricetags associated with it. Of course shortages, by definition, indicate prices could (and possibly should) be higher. However, Nintendo does not capture those increased prices. Often, Wii’s sold for hundreds of dollars above retail on sites like eBay or Craigslist. Nintendo does not receive those revenues from secondhand markets, but goes to those sellers. However, a shortage could provide it’s own marketing campaign by creating consumer curiosity and extra publicity from the odd coverage of the shortages. In a way, it increases demand through as a strange brother to conspicuous consumption. Yet, in order to capture additional revenues, Wii would need to either increase production prior to the holiday season or increase retail prices. Wii’s on eBay for $900 does not help Nintendo. Nintendo did neither. The supply and demand graph shows a representation of the market for Wii’s. The equilibrium price (what prices should be) is higher that what is set by Nintendo. Low prices encourage lower production that cannot fulfull the market. 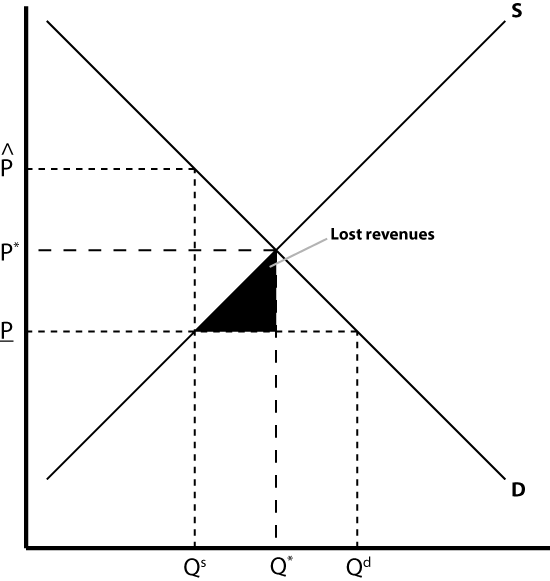 The black triangle represents lost revenues which are captured on the second hand market, [(P* – P)*(Q* – Qs)]/2 to be exact. Nintendo could profit by prices and output to P* and Q*, respectively. But without being able to expand production, as they claim, prices should increase to P hat. Ultimately, Nintendo faced huge sunk costs by expanding production. Additional equipment must be bought to expand production, a cost that can only be recovered after selling thousands of units. So Nintendo must ask themselves whether the high demand can be sustained long enough to pay for the additional buildings, machines, and land. Nintendo could have raised prices, but they were trying to signal the system to attract casual gamers. Recent data shows that the demand did not sustain past the Christmas season and recently lowered prices–a sign of falling demand. The drop in sales can be blamed on the recession and rising competition from portable devices like the iPhone. Nintendo may have made a mistake not expanding production prior to Christmas or they may have been wise to see the upcoming drop in demand. In either case, economic theory and recent data shows Nintendo didn’t benefit from the shortage and did not intentionally hold back supplies. If anything, it suggests I should quit my day job during the holiday season to focus on reselling video game consoles.